Liberals hate Wal-Mart with the burning passion of a thousand suns not just because it’s a big corporation and because it’s successful, but because it steadfastly refuses to destroy itself with unionization. Although they hate everything that Wal-Mart does, they’ve taken to regularly complaining that Wal-Mart’s pay for its employees is too low. Of course, in a country where anyone can quit a job anytime he likes if something better comes along, that’s kind of a dumb complaint, but ya know, liberals love to complain. Well, Wal-Mart has apparently had a bellyful of liberal kvetching because it decided to call out the lefties at the Nation for their hypocrisy on this issue. In an open letter to Walmart, the left-leaning: Nation: called on the nation’s largest private sector employer: to raise the pay of its employees. Wednesday, Steve Restivo, senior director of communications for Walmart, fired back. In an ironic twist, ProPublica recently reported that starting this fall, “interns at the Nation Institute will be paid minimum wage for the first time in the history of the 30-year-old program.” As ProPublica noted, The Nation has been paying its full-time interns a weekly stipend of $150 per week–less than the current federal minimum wage rate of $7.25 per hour. How is it that The Nation could complain about Wal-Mart not paying its employees enough when The Nation paid and STILL PAYS interns who work for it even less? Simple: Liberals don’t think the rules that they want everyone else to follow should apply to them. After all, they care more so they deserve special privileges. 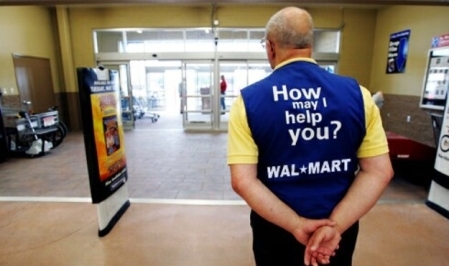 Why, interns are lucky they’re paid anything at all to work at The Nation, but a greeter at Wal-Mart? Well, Wal-Mart should break the bank paying that guy.